PENDLETON, Ore. – It was only by chance that Cody Greer ever became a bullfighter. “I didn’t even want to fight bulls; I didn’t think I liked fighting bulls,” said Greer, 25, of Chelsea, Okla. “I rode bulls all my life and was really good at it. I got hurt, and when I came back, I realized I wasn’t going to make a living doing it. It’s a good thing for bullfighting. Greer will be one of six men battling for the first Bullfighters Only event in Pendleton during a two-day championship set for Sept. 12-13 at Happy Canyon. It’s a freestyle bullfight that features man vs. agile beasts in a 40- to 60-second bout. The men will use swift feet and sometimes magical maneuvers to try to outwit the athletic bulls, which are bred specifically for this type of fight. The sport has been around for decades, but it’s been on the backburner for the majority of fans. Bullfighters Only has been putting it on the front pages. Pendleton is the 28th event on the BFO’s inaugural season. “Pendleton has a great history, and it’s exciting for us to be part of one of the most prestigious rodeos in the sport,” said Aaron Ferguson, Bullfighters Only’s founder and CEO. “We’ve been very fortunate to have been involved with some great events during our inaugural tour, and being part of the Pendleton Roundup is definitely a major highlight. That’s not too shabby for a small group of men who banded together to form the premier bullfighting cast in the game. Scores are based on a 100-point scale. Men can earn up to 50 points per fight by exhibiting control and style while working their way around the animal; bulls can earn up to 50 points based on their aggression, quickness and willingness to stay with the bullfighter. It all adds up to some tremendous excitement mixed with a taste of danger. That passion is one of the big reasons why he is involved with Bullfighters Only. The 15 men who serve as the BFO’s founders have a tight relationship. They have worked in unison to push the envelope and place freestyle bullfighting into the mainstream. “I think the main reason we’re getting to do it is because we’re always showing out,” he said. “For one, it’s one of the top bullfighters in the world, and we’re always doing something other bullfighters can’t do. There are plenty of reasons to be excited about Bullfighters Only’s future. 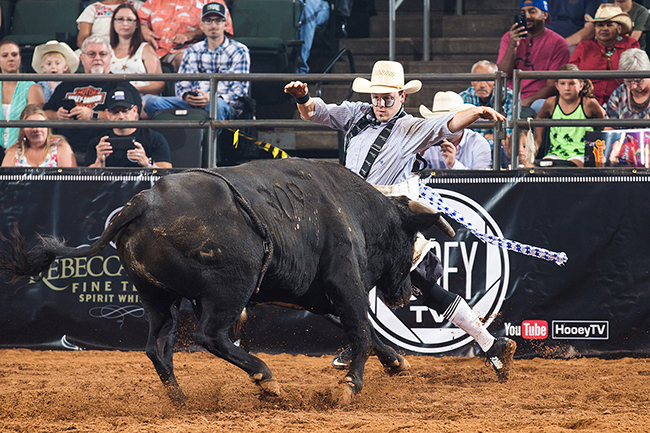 In a little more than a year, the BFO blossomed from a one-stop shop for bullfighters to order materials of the trade into a 30-event tour that features the top men in the game all competing in a sport they love.